Black and white image of a group of boys, possibly high school aged. 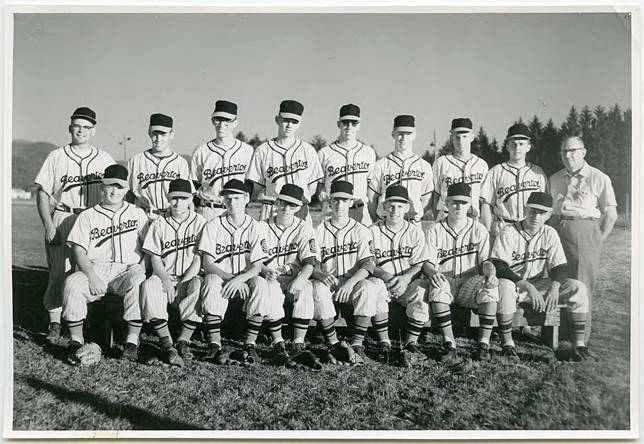 They wear traditional striped, short-sleeved baseball uniforms with 'Beaverton' lettered across the front of the their shirts. A man in slacks and a dress shirt stands to one side. The group appears to be posing on the edge of an athletic field. This image was part of the Herbert McMullen bequest. McMullen was a local photographer who also collected other images of daily life in the area.